Known as “Isla Magica,” La Gomera lives up to its moniker and continue to enchant visitors with its natural wonders and perpetual summer-like weather. It is the second smallest of the Canary Islands cradling lush ancient forests, traditional villages, and unique culture. An unspoiled land, so beautiful and captivating, it’s no wonder those who’ve visited promise to return or stay a while longer. Vastly varied landscapes and fun-filled activities await everyone on La Gomera. Go off the beaten path and explore the picturesque villages up north, the thick green forest in the center, and the appealing hotspots down south. 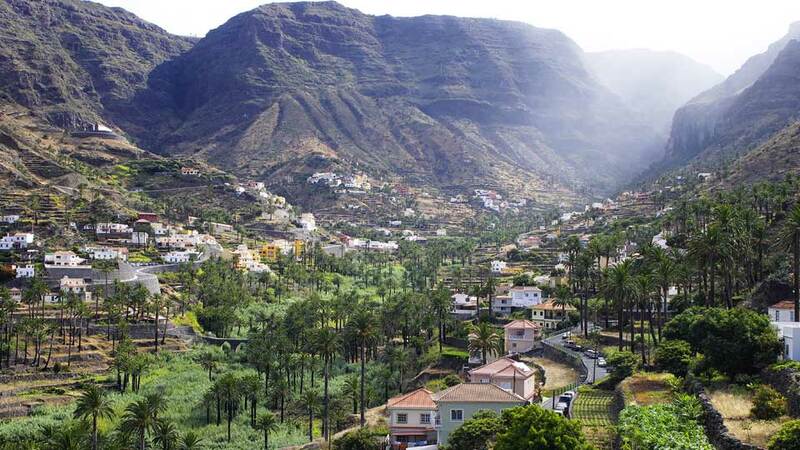 Valleys filled with banana plantations and palm trees of different species, charming villages and cultivated terraces await at the northern coast of La Gomera. Start the adventure at Hermigua, a lovely town situated at the bottom of two lush green ravines. In Hermigua, visitors can have a taste of nature’s splendor and soak up rich culture at the same time. This town houses the lovely black sand and pebbled Playa de la Caleta and two historic churches. 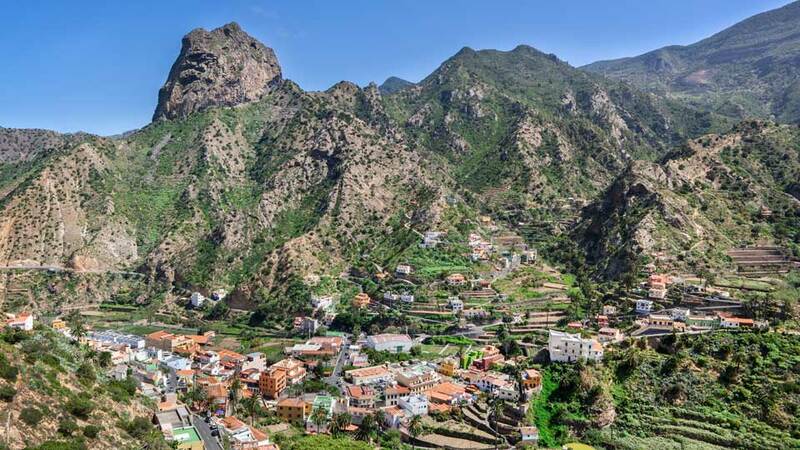 Situated 5 km north of Hermigua is Agulo, the bonbon of La Gomera. 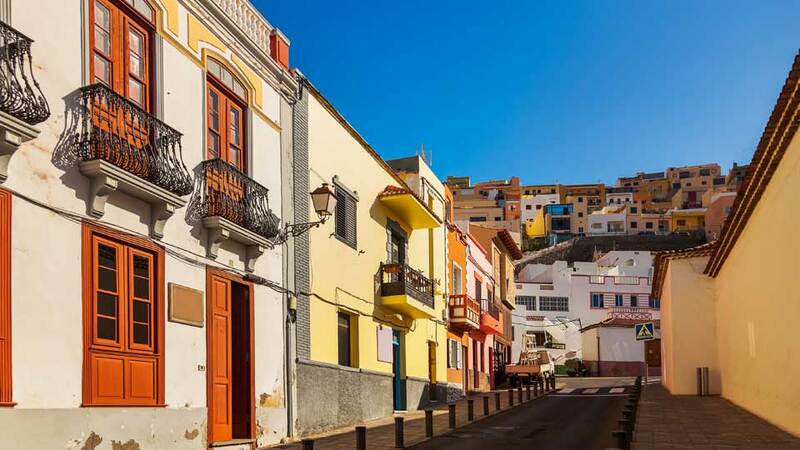 Here, cobblestone streets pave the way for beautifully-restored authentic Canarian houses. This elegant town has splendid views of the ocean and a go-slow ambiance that is sure to captivate the hearts of its visitors. Continue to Vallehermoso, the biggest town on the island. This ‘beautiful valley’ is the dwelling place of the spectacular Los Organos Natural Monument. An enormous rock formation from the ocean depths, this attraction is a sight to behold. Furthermore, this town is home to the remarkable beaches Playa de Alojera and Playa de Vallerhermoso. Dominating the heart of La Gomera is an intense green subtropical jungle, the Garajonay National Park. This UNESCO World Heritage Site, occupying 40 km2 of dense forest, extends into each of the six municipalities of the island. Explore the nooks and crannies of the Lauri Silva forest, along trails lined with tangled trees and bushes. Don’t miss El Chorro, a beautiful cascading waterfall that is the tallest on the island. Feeling a bit cramped by the density of the forest? Take the adventure to new heights and hike up Alto de Garajonay, the highest peak of La Gomera. This natural viewpoint boasts splendid 360° views of the park, the Atlantic Ocean and even the surrounding islands on a clear day. Moving on to the central eastern part, visitors surely won’t miss San Sebastian, the easygoing island capital. Aside from housing the main port, the town’s quaint atmosphere leaves a lovely taste in the mouth. Traditional Canarian architecture is evident in the city and its old buildings. Adding to its charm are Playa de San Sebastian and Playa de la Cueva, two black sand beaches that are perfect for the whole family. Witness the ever-changing landscape of the sunny southern part of the island. From arid peaks to plantation-filled valleys and from black sand beaches to dramatic coasts, the towns of the south know how to keep their visitors entertained. Explore the modest Playa de Santiago, the southernmost village of the island. This peaceful fishing village glitters in the morning as the magnificent sunrise sparkles over the water surface. Restaurants and cafe-bars dot the coastline, where visitors can sample the freshest seafood on the island. Then, venture out to Valle Gran Rey, the center of tourism on the island and all for good reasons. The list of viewpoints on this area is as long as its tapas menu, and it would be a shame not to stop at one of them on the way down to the shore. More than a municipality, Valle Gran Rey is a collection of delightful villages and conventional towns that cascade down to the Atlantic Ocean.